The minimum cross-section of the steel sheet piles is determined by the bending moment under special circumstances. In addition, it is necessary to consider the problem of piling, especially for the difficult piling, so as to avoid the buckling of the steel piles during Piling. In addition, the effective life of retaining walls should be considered. Corrosion will reduce the strength of the steel sheet piles section, which must be designed to ensure that the selected section of the steel sheet post-use strength is still sufficient at the end, Does not buckle or exceed the design stress. 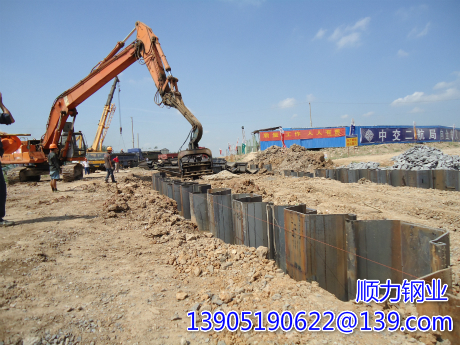 In many cases, if there is no need to increase the strength, taking into account the piling requirements will automatically use large-section sheet pile. When the earth pressure is calculated, the active and passive earth pressure is assumed to be linear and does not take into account the interaction between the soil and the steel sheet piles. It is shown that this has a large effect on the distribution of earth pressure and The moment and shear forces in the wall. The deformation of the supporting flexible wall between the supporting point and the wall embedded in the soil part will deviate from the soil. This deformation will lead to the formation of the arch in the soil, so That the soil will play its potential supporting capacity to reduce the effect. The pressure on the wall. Deformation of flexible structures such as anchoring pile-sheet walls will increase the pressure above the anchor rod, which is due to the support of the wall as A fulcrum towards the soil movement, thus reducing the support point of steel sheet piles wall deformation maximum pressure. The result of the pressure redistribution is that the maximum bending moment of the wall is reduced, but the support reaction force is increased. The supporting reaction force obtained by the limit method is generally lower than that produced by the interaction between soil and sheet pile . Likewise, the bending moment does not need to be reduced if the support is likely to yield or the end of the pile will will be damaged by vibration or impact loads, there is no need to consider pressure redistribution. For "cantilever" structures, which may be damaged by vibration or impact loads, Move. Where soils are layered, bending moment reductions should be carefully considered because soil arches are less likely to form in different soils. In soil / structure interaction analysis, it is necessary to consider the beneficial effect of soil arch on the bending moment of the wall automatically.